I HATE rollercoasters. They make me nauseous, super dizzy, and I feel sick for the rest of the day. I don’t fear them, and I’ve never been afraid of heights. But I don’t understand why people like that… “my stomach is falling out of my body” feeling. 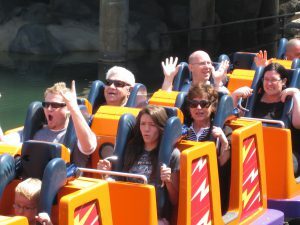 To me, emotional rollercoasters are pretty much the same as an actual roller coaster. I’m nauseous, dizzy, sick for the duration and a while after, and I don’t particularly like the falling feeling my stomach keeps performing. BUT that is precisely what we were on for the next three weeks. It was intense and insane. I lived half of the time up north, getting to know the girls, and the other half of the time I was at school getting my classroom ready for the teacher that was taking my place. “Surreal” is the best way I can describe how I felt. On the weekends I was a mom (and a brand NEW mom at that) and during the week I was living my same-old regular life. Every night we FaceTimed the girls to talk to them and countdown the days until we would see them again. The transitioning stage varies depending on how far away the child(ren) is/are. Since we were so far away we traveled a lot. Luke had to work, and I really wanted to set up my classroom, because I had given the incoming teacher so little time to get ready. For some families that are in the same town or close by it can occur more quickly. It can also be more gradual in learning to become a family. The Friday night after we met the girls, we headed back up north, in two cars, for our second visit with the girls. The social workers wanted us to spend increasingly more time with the girls, but Luke needed to keep working. (Isn’t it fun, being an adult?) We wanted him to have some time-off leftover when the girls permanently moved home with us. So the plan was for me to stay with the girls longer while he went back home to work. I was scared. On top of the fact that I was staying by myself on like my fifth day being a mom to three toddlers, we were also doing overnight visits. Saturday morning, we went and picked up the girls from their foster family and took them back with us to Luke’s aunt and uncle’s apartment. It was a rough night. Luke and I didn’t sleep at all because we could hear every breath and movement each child made. Sunday, we had a visit with the foster family and the girls’ adoption specialist. I thought it would go terribly and the girls would want to go home with them, but God had it under control. Everyone was fine. Then, at dinnertime Luke headed back home. For two nights I was on my own, and it was a little terrifying, but it went really well. Considering I was a new mom, had three toddlers, was in a town I didn’t know at all, and I had to find ways to entertain and contain them, I was doing well. I also had my first experience with rude judgmental people. I had no idea that people would assume negative things about my children, and me simply because they didn’t look like each other or me. Or that they would announce these rude things so loudly and in front of my children. By the grace of God, I stayed calm (and I really don’t say that lightly). I could’ve easily ripped someone’s head off in that angry mama bear moment. But instead, I icily responded and diffused the situation. Tuesday, I dropped my sweet girls off at their foster family and promised to be back very soon. My littlest one was quite upset at me. It broke my heart. She wouldn’t even say bye to me or look at me. On the following Friday, I drove to the halfway point between our house and the foster family’s to pick up the girls. This time they got to come home with me and spend a four-day weekend with us. We had wonderful time. For the first time, our home life met with our new life. 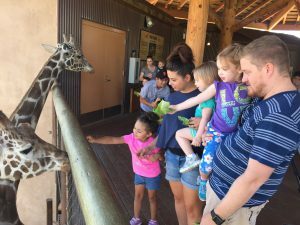 We went to the zoo and explored what it meant to be a family of five. Along with the fun and joy we got to experience the trauma our girls had been through. Although the foster family, Luke, and I agreed the back and forth was getting to be too much and too hard on the girls, the adoption specialist did not. We were required to send them back to the foster family one last time. The girls went back on Tuesday, and that Friday morning we picked them up with all of their belongings (they had a ton, which isn’t always the case) and FINALLY headed home to stay.